Powder coated yellow schedule 40 steel. 10" x 12" x 1/2" base plate. 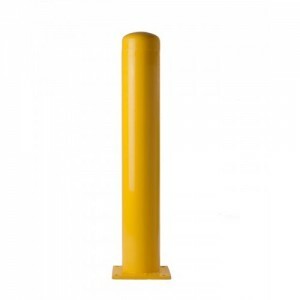 Concrete Anchor Bolt.5/8" x 4.5".Used with Bolt Down Bollards.Sold Individually. ..
4" OD x 36" H with 8" round base plate.Weight: 26 LBS.Stainless Steel 304 Finish.No core drilling or..
6.6" OD x 36" H with 11.5" round base plate.Stainless Steel 304 Finish.No core drilling or excavatio..